The result are summarized in the graph above. The latest poll results from period #9 are somewhat of a surprise. The overall trend for Poll #9 on STAP stem cells would seem to indicate a significant shift toward a more positive view, at least for the category “Close Yes”, meaning close to convinced that the cells are real. This seems odd given no apparent change in the STAP cell news stream to account for this. If you break down the respondents for Poll #9 by country, we see that Japan (9J) remains extremely skeptical and the US respondents are also not particularly inclined to be believers in STAP at this point. However, oddly, 3 European countries account for almost all the “Close Yes” votes overall: Germany, France and the Netherlands. Do folks there know something about STAP that we do not? Or are some people from those countries just playing around with the poll via their collective votes? 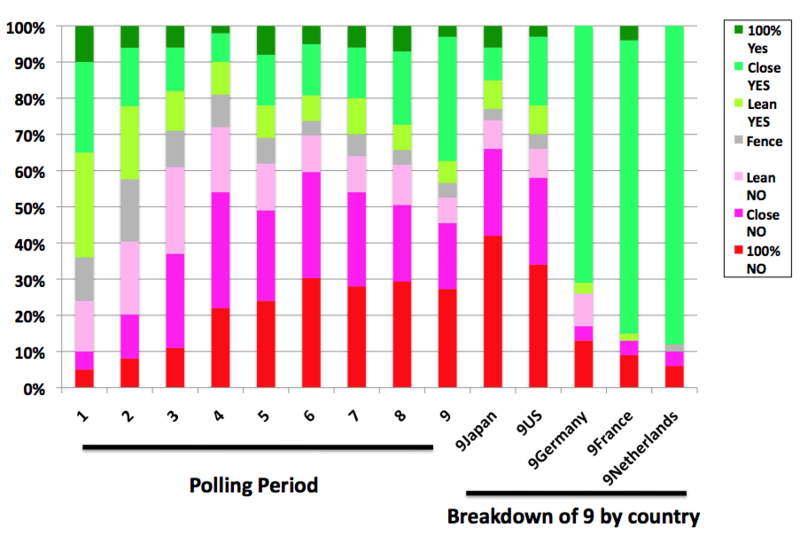 If people in those countries were really shifting so strongly toward believing in STAP in poll period #9 then why so few votes for “100% Yes” by them? The stats for this poll–we had 1030 respondents. Each IP address is only allowed one vote per week. Keep in mind this poll is not intended to be scientific. I’ll start Poll #10 soon and we can see how that one goes…another question is whether there is any point in continuing to poll about STAP cells anymore. They are pulling your leg! They’re messing with you Paul! I feel there’s no need for any further polls unless someone pulls some cell phenomenon from thin air! Great job covering the story, Paul! I have never posted on here before, but I’ve been reading the blog for several months now. I really appreciate all the effort you put in – and as an aspiring young investigator myself I admire your gumption in being committed to outreach despite grumblings from the old guard. As far as the STAP story – it’s definitely time to move on. The last few posts have felt stale to be honest, simply because the story has run it’s course. Unless someone is able to reproduce “the STAP phenomenon” there is no need for further coverage beyond quick updates when action is taken by Nature on the papers. I see this whole sad episode as a time to look inward and find out what can be learned. It appears that at worst the results were maliciously, that is consciously, fabricated from an early point in the timeline of the research. I don’t want to believe that, and based on some of her comments, I can’t help but think that Dr. Obokata truly believes in “the phenomenon” on some level. Personally, I feel that Dr. Obokata probably tricked herself into believing in something that wasn’t real, due to a combination of hubris, lack of sufficient background knowledge (She didn’t know that stressed/dying cells can exhibit significant autofluorescent? That is a very basic artifact that anyone doing cell biology should be aware of, and take care to control for), and probably a good dose of outright conscious misconduct – although I believe this probably happened later, after “a point of no return” had been crossed so to speak. Feynman said to be careful about fooling yourself because you are the easiest one to fool…and I think that adage could be especially poignant in this case. The really sad part about the whole story is that there is so much exciting and important work being done in stem cell biology and regenerative medicine. You do a great job of keeping a balance and covering all the stories, but all the attention on STAP (not just on this blog, but across the web) feels a lot like the mainstream media’s tendency to focus on the dread and by consequence ignore the positive stories. For me it raises a broader question that transcends the boundaries of this blog: will the public always prefer the negative stories? On the web, news sites are all about clicks and views, and it’s easy to see a scenario where blogs/sites are encouraged to harp on the scandal/drama at risk of losing traffic. Again – just a general musing that is not meant to characterize this blog or your efforts in any way. I disagree regarding the “time to move on” bit. Paul and others have done an excellent job in keeping the STAP deabcle in the minds of the community and the public. But so far, neither Charles Vacanti nor Nature have given any indication that they are willing to retract the papers and admit that publishing them was a big mistake. From a newsdesk-perspective the story is indeed fading. Arguably this is exactly what the journal Nature hopes for. But we really do not want to see another crappy paper standing uncorrected in the scientific record, because Nature just rides the storm. If this poll is not “scientific”, this figure is reasonable for me. I am not very interested in science, but here is the thing I found. The theory in science field and others are different. * I just want to say that these are different. It is not a matter of which is right. you have to show the evidence in order to prove it is true or valid. you have to show the evidence in order to prove what he or she is saying is not true. unless you can show the evidence to prove it is not true, it has to be　considered as true. The only thing I can do is to express my opinion as a non-scientist. It is natural for me to judge the existence by looking at who she is, what kind of attitude she takes, and the circumstance she is in. 1 Some scientists may suspect that she falsified the results of her study. But as far as I know, there is no reason for her to have to falsify the result. Because most of benefits will go to her company even if she did it. I don’t know about her company, but, at least, I can say most of Japanese companies work that way if she did it. So I think there is no motive her to falsify it. *I have been working in Japanese organization for 10 years, and I know what Japanese companies are like. 2 She said that she really would go anywhere to reveal the details on how to reproduce STAP cells, if she is allowed to do so. But unfortunately, she is not allowed so far, because of the patent of her company or so. Do you think the person who did falsify the result can make such a public comment? Maybe the thesis itself is not perfect, but after admitting her mistakes, how can she prove the existence of STAP cells when she is not allowed access to her lab where she could reproduce the evidence. I know another fact which keeps her in a weak position, but I don’t want to make my comment any longer than it already is . I understand that we need to be cautious about the possible existence of STAP in this situation. unless you can show the evidence to prove it is not true, it has to be considered as true. For that reason, I believe in STAP cells. * I wrote this comment in English and Japanese, because I want to show it for both Japanese and English-speaker. To your point about the justice system – it has been proven “not true”. There was a paper recently published on F1000 (and featured on this blog) that convincingly shows an inability to reproduce the results. In addition, this blog hosted the posting of data (should be noted that it was not peer reviewed, just ‘off the press’) from several investigators/labs – with all evidence pointing toward ‘not true’. If this were a court of law, I would say the prosecution probably has the jury in the bag. The overwhelming majority of evidence points toward non-existence of STAP cells. To me the non-existence of STAP cells (as described in the Nature papers) is a given (sadly) at this point. Of course this or similar phenomena may exist, but when the whole scientific community can’t reproduce the results as described in the papers and subsequently published protocols (as is the standard of validation in science) we are left with no choice but to consider the results false/fake. The bigger issue is who knew what when in terms of the data not indisputably supporting the existence of STAP. As for her motivation – your argument there is very weak. As a principal investigator in an academic setting you are basically a small business owner – your work builds your reputation and controls your ability to publish, acquire funding and perpetuate your research career. Therefore, there is plenty of motivation to fake the results. That is a huge problem in science today in general – so much pressure to publish, such low funding rates, etc…this all creates even more pressure that can lead one down compromised paths of action. I am not sure about how RIKEN is organized, so I can’t really speak on how her position as a new PI compares to being a young investigator in the USA or Europe for example, but to say that “her company”, i.e. RIKEN would get all of the credit is at least naive, possibly disingenuous depending on how forthright you are being about your true understanding of the situation. 1 I tried to input Japanese comment, but I could not do it because of error. 2 I believe this pole has to be continued. b) scientist and non-scientist are so important. Whether or not STAP stem cells exist as phenomena I don’t know. But surely it is wrong at this stage to say that numerous failed replications have taken place. I personally don’t see the evidence for that. I can easily imagine that many labs who might have been inclined to test the alleged phenomena are now steering away from it because of the controversy. I believe RIKEN are trialing the experimentation again to see if replication occurs as a means of testing the assertions made in the public papers on STAP. However, this is likely to take some time. Beyond that we have only the Hong Kong University report, which seem to veer from dismissal to encouragement to dismissal again. Given the big doubts of why a STAP phenomena should exist ( and I think people are struggling to see why the body would have such a simplistic mechanism) those who favour the idea of testing it have an uphill struggle against the weight of controversy and evidence so far, to merit a programme of testing. Given Prof. Vacanti is probably the most avid proponent of STAP, it will be interesting to see how, if at all, he proposes to take it forward. I see parallels between the current situation involving Dr. Obokata and STAP cells, and a controversy that erupted in the 1920s in Vienna. A very skilled biologist (an animal-handler, really) by the name of Paul Kammerer, by breeding various species of salamander including a frog known as the Midwife Toad over many generations under different environmental conditions, apparently stumbled upon the existence a phenomenon known as the inheritance of acquired characteristics. However, his ideas were met with great resistance from some of his contemporaries, including the influential neo-Darwinian biologist William Batseon. Lo and behold, in a case notoriously involving India ink, one of Kammerer’s midwife toad specimens was found to have been tampered with so as to enhance the appearance of a *nuptial pad* (used to grasp a female under aquatic conditions). The presence of the pad would have shown that a structure previously nonexistent in past generations had arisen as a result of environmental influence (Kammerer had carefully raised dry-land frogs under aquatic conditions for a number of generations). In the end, Kammerer and his work were discredited, and Kammerer committed suicide in 1926. (See the fascinating book The Case of the Midwife Toad by Arthur Koestler). Recently, there have been calls to replicate Kammerer’s studies, most notably by Alexander Vargas of the University of Chile, since they may have demonstrated the existence of what we now identify as transgenerational epigenetic inheritance, a phenomenon increasingly recognized as real. The point is that ninety years have passed since Kammerer did his work, and we still don’t know if he was right. The opportunity to find out was lost in the midst of the controversy that arose (and also world events affecting Austria). Kammerer had dedicated his life to his work; he was by many accounts a brilliant researcher, if a bit unorthodox (he allegedly composed symphonies at night). To me, it seems a dim possibility that someone will come along today who has the interest, the stamina, and the great skill required to raise amphibians through many generations in order to replicate Kammerer’s work. Kammerer’s peers did not believe him; they discredited his work. Yes, he was flawed. But imagine how much sooner we might have known about the reality of epigenetic inheritance if we had been less quick to judge back then. I can see similarities with the Obokata/STAP controversy we are having today.